I'm getting better at it, but getting protein has still been difficult for me as a vegetarian, especially after an intense workout. I've begun to rely on protein supplements, like bars and smoothies, on days when my protein intake has been particularly low. Since I've been trying so many different ones, I thought it would be a good idea to make this a series and find out which protein supplement is best. I'll be ranking each supplement from 1-5, with 1 being terrible and 5 being great. There will be three criteria: protein and nutritional content, taste, and availability. 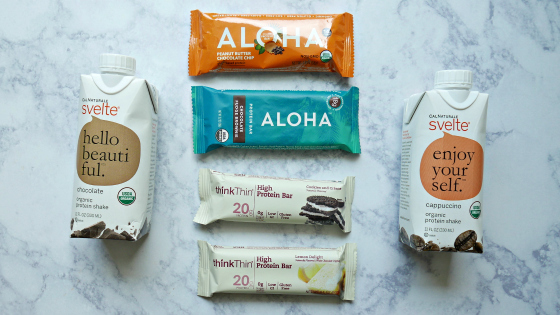 For this post, I am going to review Think Thin High Protein Bars, Aloha Protein Bars, and Svelte Organic Protein Shakes. Protein and Nutritional Content: With 20 grams per bar, the Think Thin High Protein Bars contain the most amount of protein compared to the other two protein supplements. And while vitamin and mineral content varies among flavors, many contain some calcium and iron. Taste: Not bad. It was a little chalky but not too noticeable. Sweet, but not overwhelming, and chewy but not gummy. Availability: I got these at Giant Food Store, and I've seen them in Target and Costco, as well as Amazon. So they're pretty easy to find. 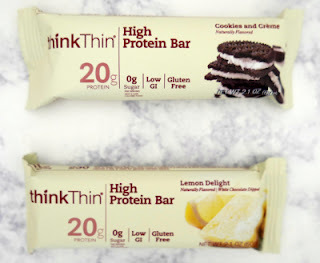 Overall: I would give the Think Thin High Protein bars a solid 3/5. They're good. Not great nor bad, but will do after workouts or if I need a quick snack. They have vegan options, and with so many flavors, there's something for everyone. Protein and Nutritional Content: It varies from flavor to flavor, but it's about 14-16 grams of protein. They're also packed with fiber, as well as calcium and iron. Taste: Oh boy, where do I begin? I've always wanted to try Aloha food and supplements, but these were probably not the best to start with. The chocolate fudge brownie tasted better than the peanut butter chocolate chip, but not by much. There wasn't much flavor, and they were so dense, it hurt to chew. Availability: They're at Giant Food Stores, as well as many places online, so I don't think it's that hard to find them. Overall: Aloha Protein Bars get a 2/5. For me, I won't be purchasing again, but being vegan, gluten-free, and soy-free, they're a good option for those with dietary restrictions. 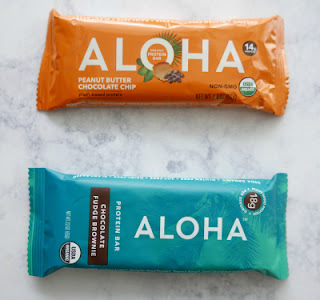 I will say that I would try other Aloha foods and supplements, just not their protein bars. Protein and Nutritional Content: What Svelte lacks in protein (11 grams), it makes up in overall nutritional content. Along with fiber, they also contain a substantial amount of vitamin A, B12, D, and E, as well as zinc and riboflavin. Taste: Svelte surprised me. I expected that, out of the three, it would taste the worst. It actually tasted the best. I had chocolate and cappuccino; both were tasty, but I like the cappuccino better. Availability: I also got these at Giant, but I haven't seen them anywhere else. They are also online, and I found them pretty easily on Amazon. Overall: Svelte Organic Protein Shakes get a 4.5/5. They taste great, and with protein, fiber, and vitamins and minerals, they make for a pretty well-rounded snack or even late-night light meal. The only reason I'm docking half a point is for availability, but that could easily change if I see them at other brick and mortar stores. 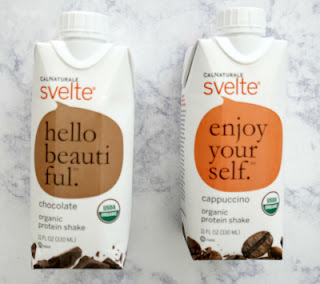 I have repeatedly bought the Svelte Organic Protein Shakes (and currently have two in my refrigerator). I have only tasted the chocolate and cappuccino, but I plan to get other flavors. Let me know if you want me to try a specific protein bar, shake, or any other supplement!